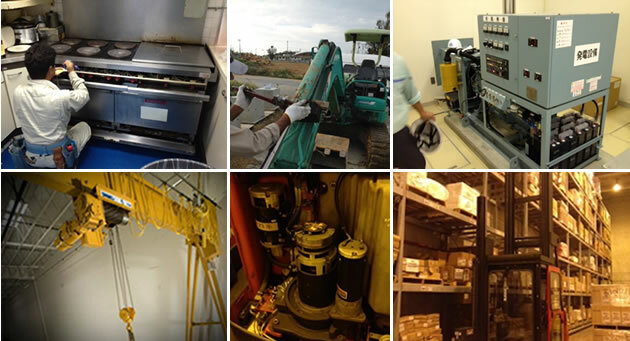 Since our start, we have been dealing with construction and industrial machinery and materials for building contractors and construction companies in Okinawa’s both mainland and out islands. We sell, rent out, maintain, and repair them. We introduce the materials from various brands meeting your needs. We sell both new and used construction machinery, choosing a suitable one for your construction. We rent various kinds of construction machinery and equipment. We display different types of used containers in the showplace. Come and check! You may find a perfect one for your need. We do scaffolding and various general construction works for private, public and U.S. Military. Our staff with First Grade of Construction Machinery Knowledge and Maintenance Skill Certificate, national professional qualification will provide proper and sure maintenance. We are also expert with foreign-made machinery since we have long time business with U.S. Military. Thanks to the business with U.S. Military in Okinawa, we can provide you foreign materials and machinery parts. We have had business with many foreign makes and can procure a small lot of materials and machinery parts.